Cheng Shifa (1921-2007), was born in the Jiangsu province in 1921. He came from a family of traditional doctors. After studying painting on his own, he entered the traditional painting department of the Shanghai Academy. He once earned a living by doing serial illustrations, known as lianhuanhua, calendars, and New Year pictures. After 1949, he joined the East China People’s Publishing House in Shanghai and began to acquire a reputation as an accomplished book illustrator. 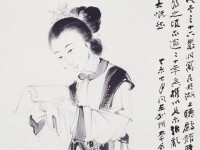 Today, Cheng Shifa is best known as a guohua ink painter and his strength is figure painting. 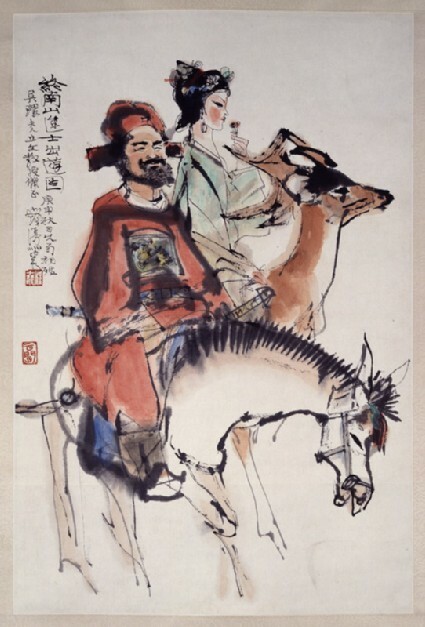 One of his favourite subjects is the demon-queller Zhong Kui riding with his sister or marrying her off, as depicted in this painting. Zhong Kui was a 7th century scholar who failed the national exam. In Chinese folklore, a legend developed around him as a demon queller. Cheng’s brushwork is lively and sensitive, often with a pleasingly staccato rhythm. This painting was inscribed by the artist to Khoan (1919-2003) and Michael Sullivan (1916-2013) in 1980, when they visited his home in Shanghai. The inscription on the painting reads “The Excursion of the Jinshi Scholar of the Zhongnan Mountain. [Painted] On an autumn day of a gengshen year . A casual brushwork by Shifa. For Madam Khoan and Professor Sullivan to appreciate.” The couple visited China and many Chinese artists in 1980 at the invitation of the Chinese Artists’ Association.